Are you the next Muddy Waters or Buddy Guy? 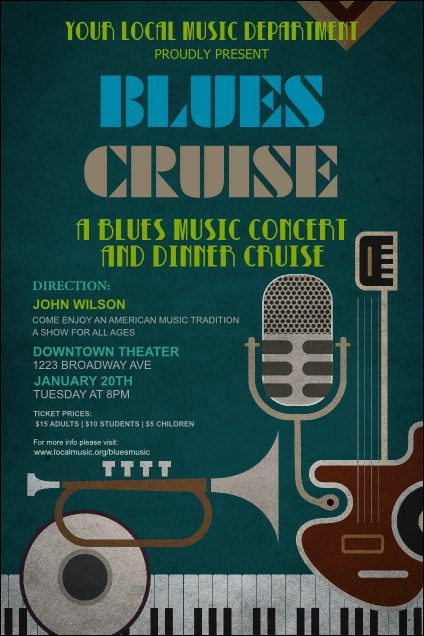 Whether you're just starting out or you're a seasoned pro, promote your next show with the Blues Poster. Featuring a variety of instruments perfect for blues or jazz, this template includes eighteen lines for all of your event information. Poster measures approximately 11.46" by 17.18"
Need fliers, tickets, or invitations? Order a Matching Event Kit from TicketPrinting.com.